Jane Tesh. A Bad Reputation. Scottsdale, AZ: Poisoned Pen Press, 2014. Madeline (Mac) Maclin loves her husband Jerry, but that doesn’t stop her from worrying about him. Good-looking, musically gifted, rich-boy Jerry had a short career as a con man. Since Mac and Jerry moved into a house that Jerry inherited in little Celosia, North Carolina, Jerry has been at loose ends. He needs to work or he may get into some mischief. When one of Jerry’s former associates comes to town, Mac starts to worry–about Jerry’s commitment to reform and his commitment to their marriage. Jerry’s been thinking about the marriage too. He loves Madeline with all his heart, and he wants them to have a baby. Madeline is not sure that she’s ready for children–both her detective business and her art career are just getting off the ground, and Jerry still has some emotional scars from his childhood. Plus, Jerry doesn’t really work and doesn’t want any of his family’s money, so the Maclin-Fairweather family budget is already stretched. And, they are both busy. Jerry will play in the local production of Oklahoma, Madeline has a new case, and the whole town is abuzz about a new art gallery that will be opening downtown. When Madeline tags along to a reception for the new gallery owner, she gets an earful of backbiting comments. It seems that the local arts community is a hotbed of personal rivalries, long-remembered slights, and sharp elbows. The new gallery owner, Wendall Clarke, is not surprised by this. He’s a local boy who went off to make good. Now he’s back with lots of money and a new wife. His ex-wife, Larissa Norton, is at the reception, ready with verbal jabs for one and all. When Wendall is found murdered the next day, Larissa is Suspect #1. But as Madeline soon finds out, there is no shortage of people who wanted Wendall dead. Jane Tesh. Now You See It. Scottsdale, AZ: Poisoned Pen Press, 2013. Rabbits are the animals most often associated with magicians, but Wizards of Wonder, the magicians club in Now You See It, is more of a snake pit. The Finch brothers, Lucas and Taft, are the peacemakers in the group. They get the idea to channel their colleagues’ energies in a positive direction by having a contest. Whoever can open the special box the brothers have–a box that once belonged to the great magician Harry Houdini–can help themselves to any of the the brothers’ magic props. But before the contest gets going, someone steal the Houdini box. Although this is clearly a crime, the Finch brothers do not want to involve the police. Instead they contact David Randall, a private investigator who is the main character in this and the two earlier books in the Grace Street Mystery series. David’s business is just limping along, so he is happy for the case. But when Taft Finch is murdered and one of the other magicians attacked, David knows that this is about more than a simple theft. Professional jealousy, deception, thwarted romance all swirl together. This is the third Grace Street Mystery, and characters and issues from the early novels are present in Now You See It. David’s romance with Kary is progressing, and David’s dreams of his dead daughter are becoming more a source of comfort than pain. David’s housemate and friend, Cameron wants to propose to his lady love, Ellin, but she has been distracted by her job on the Psychic Service Network–and her work problems cleverly figure in the plot. Jane Tesh. 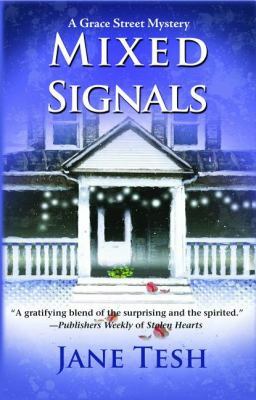 Mixed Signals: A Grace Street Mystery. Scottsdale, AZ: Poisoned Pen Press, 2012. David Randall, a private investigator in the fictional small town of Parkland, North Carolina, thought this Christmas was going to be peaceful. But when your best friend is a psychic, you’re in love with a superhero, and you live in a boarding house with a crowd of oddballs, how could any day be normal, much less peaceful? David’s eventful holiday season begins with the discovery of a murder victim. Camden, the P.I.’s psychic best friend, keeps having disturbing flashes of the killer’s mind. It’s troubling enough to have visions of murder, but these insights make Camden suspect that he knows the killer well. This connection is overwhelming to the sensitive Cam, and David worries for his friend’s mental state. Murder would be difficult enough to deal with, but a group of superheroes dedicated to justice on the streets of Parkland has sprung up, and David’s lady love, Kary, has joined them. But could one of these supposed superheroes really be a supervillain? He wants to find out, but his progress is hampered by two dogged journalists angling for the inside scoop. Our protagonist’s holiday madness is complete when his mother comes to town. Normally David would love to have her, but all she wants to discuss is his daughter Lindsey, whom he lost to a tragic car accident some time ago. That, and her new octogenarian beau Grady, of whom David decidedly does not approve. Will the determined P.I. find the murderer, lay his troubles to rest, and dodge reporters successfully? Not without mayhem, hilarity, and some serious sleuthing. Jane Tesh. Stolen Hearts. Scottsdale, AZ: Poisoned Pen Press, 2011. David Randall is down on his luck, sleeping in his car, when he hears police cars rushing down the street. It appears that a burglar has broken into Albert Bennett’s house and killed the old man. The crimes galvanizes David the way almost nothing has since his young daughter died a few years back. After a mediocre career as a private investigator and two failed marriages, David wakes up and tries to take back his life. He will avenge Bennett’s death and in doing so redeem his own life. Unfortunately for David, Albert Bennett’s murder is not an open and shut case. For starters, why would anyone break into a rich man’s house and leave with nothing but an old notebook found on the front lawn the night of the murder? And what does all that gibberish in the notebook mean? Is it music? Before David can get very far into the case, he realizes that he needs a place to stay and a place to call an office. His obliging friend Camden provides both, but Cam is a psychic who runs a boarding house, so suddenly David has a place to hang his hat, but also lots of complications, including a lovely fellow boarder who may help him forget about his unfortunate marital track record. 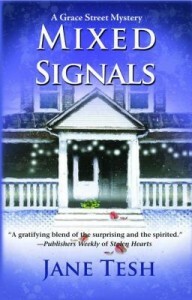 This is a book for music buffs and those who like their mysteries spiced up with a touch of the paranormal. 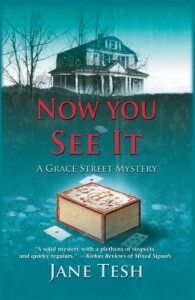 This is the first novel in Tesh’s new series, the Grace Street Mysteries. Jane Tesh. A Little Learning. Scottsdale, AZ: Poisoned Pen Press, 2009. Madeline Maclin “Mac” Fairweather has it all: an adoring husband, Jerry, recognition as a budding artist, and notoriety as a successful private investigator after solving multiple murders in Celosia, a small (fictional) North Carolina town. Life is never dull for the former beauty queen, and this week is no exception. On Sunday, she is asked to crack a difficult, time-sensitive riddle that involves a large inheritance. While giving an art presentation on Monday, a despised teacher collapses from a heart attack, although Mac thinks the death is suspicious. And on Tuesday, séance-enthusiast and former conman Jerry is attacked while working at the local bookstore. How could seemingly harmless children’s collectible cards drive someone to use force on a stranger? Are all of these mysteries connected, and will they be solved in time and without more deaths? Mac Fairweather, PI, is just the woman for this complex and dangerous job! A Little Learning is Jane Tesh’s third book in her Maclin Investigations mystery series. Jane Tesh. A Hard Bargain. Scottsdale, AZ: Poisoned Pen Press, 2007. Madeline “Mac” Maclin gained a bit of notoriety when she solved the murder of a local beauty contestant in A Case of Imagination, but the good people of Celosia, North Carolina still see her as a former beauty queen, not a private detective. Desperate for work, Mac agrees to locate a man who left some cartons stored in Frannie Thomas’ guest bedroom. Frannie let Kirby Willets store those boxes as a favor to a local librarian, Bernice Coleman, but now Frannie’s mother is coming to live with her and those cartons have got to go. From this innocuous start, Tesh spins a tale that includes a faded Hollywood star, a monster in the woods, a secret love, and a fair share of small town quirkiness. While looking for Willets, Mac also tries to help her boyfriend Jerry comes to terms with his childhood; Jerry’s backstory adds depth to the novel. This is the second novel in the Maclin Investigations series. A Case of Imagination. Scottsdale, AZ: Poisoned Pen Press, 2006. A Hard Bargain. Scottsdale, AZ: Poisoned Pen Press, 2007. A Little Learning. Scottsdale, AZ: Poisoned Pen Press, 2009. Madeline “Mac” Maclin is the former Miss Parkland, Parkland being a fictitious city in the North Carolina Piedmont. Mac has left the pageant world behind for a new career as a private investigator. Love (or, the hope of love) takes her to the small town of Celosia (also fictional) where she sets out to solve mysteries and wear down her boyfriend’s reluctance to give up his questionable businesses and settle down. Celosia is a town with its share of good folks and crazies. 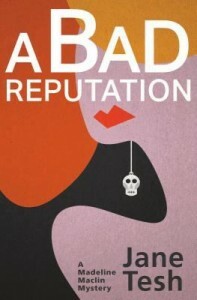 Each novel is populated with memorable people from boyfriend Jerry to local bookstore owner Georgia, to Ted Stacy (potential rival to Jerry), to the “Pageantoids”–beauty pageant enthusiasts who are sure that Mac’s coaching could help some local girl become Miss North Carolina. As Mac struggles to get people to take her seriously, danger and humor intertwine. Jane Tesh. A Case of Imagination. Scottsdale, AZ: Poisoned Pen Press, 2006. Madeline Maclin is the former Miss Parkland in the fictional Piedmont town of Parkland, N.C. She has just opened a detective agency and is having a hard time getting people to take her seriously. That changes quickly when a friend and potential love interest inherits a house in nearby (and also fictional) Celosia where Maclin gets mixed up in a local beauty pageant and is soon involved in her first murder investigation. This is the first novel in Tesh’s Maclin Investigations series.